Is your presentation a futon? 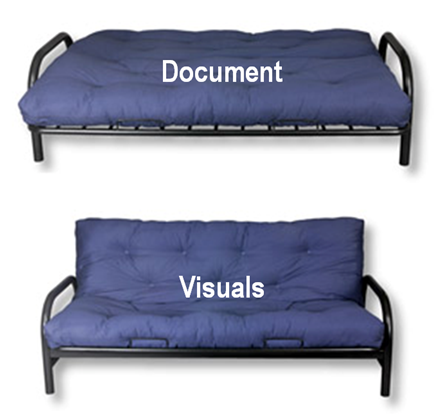 A lot of presentations visuals that I see are like futons – not really a document (not enough detail) but not really presentation visuals (too much detail); they are caught in-between. While “multipurpose” may work for some things, presentation visuals are not one of them. You may only have one opportunity to present your idea, concept or product; you don’t want to water down your message with dual-purpose visuals. So how can you avoid having “futon” presentation visuals? It helps to use the right software for the right application. For example, if you need to send information to a group or to produce a handout, use Microsoft Word (or equivalent) instead of PowerPoint. Using Word allows you to use a document format … you can write in complete sentences and provide more detailed explanations (instead of abbreviating content into bullet points on PowerPoint slides). If you feel you must use PowerPoint because it’s easier to include images and other visuals, then write it as you would a document and send it out in PDF format. That way everyone knows it’s meant to be a document. But use different slides for your presentation. You can also turn your presentation visuals into notes. I sometimes rework my presentation visuals (in PowerPoint) into notes. I add more detailed explanations and edit them down into a “readable” notes package. I then convert them into “2-slides per page” PDFs so that no one mistakes them for presentation visuals. It takes a bit more work but I can at least avoid making a futon. As Garr Reynolds says “Slides are slides, documents are documents; they are not the same thing.” And a futon is not really a couch, or a bed.